Champagne Region & Champagnerie Visits - a Champagne Day Tour is a must visit and tasting experience of the finest Champagneries in the world. The Champagne Houses offer visits and tastings, plus a visit to the Cathedral of Reims where the Kings of France were crowned. It is one of the most beautiful Cathedrals in France, and the town of Reims itself offers a variety of cultural things to see and do. By Minivan or Motorcoach, you'll be glad that you visited the France Champagne houses and the rest of the morning is spent near Epernay where you will visit a traditional vine grower’s. Depending on the season, you will get the chance to see the grapes being pressed or the wine blended. Whatever the season you'll get to taste the finished product with a glass of the vineyard's own champagne. Chateaux of the Loire Valley- on this page you'll find les Chateaux de la Loire as well as some of the more noted national [Royal] and privately owned historical and medieval French châteaux. Shown at the left is Chenonceaux, which is believed to the most beautiful of the Loire Valley Châteaux. It is privately owned now, but you can read more about it here. There are the magnificent and historical walled cities, abbeys, cathedrals, châteaux housed B&Bs, and of course tours to visit these spectacular monuments. Chateaux Country offers 2 to 4 Days Chateaux possible visits to Blois Castle, lunch on your own at Amboise, visit Clos Luce, and gardens of Villandry. Overnight and dinner in Tours, Day to visit Chenonceaux, Cheverny and Chambord. Lourdes by TGV - 2 Days / 1 Night - in 1858, the Virgin Mary appeared 18 times, in the grotto of Massabielle, to a poor 14-year-old peasant girl, named Bernadette Soubirous. Today Lourdes welcomes 5 million pilgrims annually from 150 countries. On Wednesday (summer only), transfer from our office to the Montparnasse station (Paris) with our representative. Board the Atlantic TGV train. After a pleasant journey in one of the world's most modern trains, you will arrive at 3.42 PM at Lourdes. You will be welcomed by a representative from Lourdes Tourism and will be transferred to the Hotel La Solitude (or similar), modern hotel located at the entrance of the Sanctuaries. You will have free time for the rest of your stay : for instance, do not miss the evening procession. Monet's Giverny Day Tour from Paris - visit Monet's Giverny Home, AND Gardens and museum. This undoubtedly is one of the most visited and loved tourist spots outside of Paris The gardens are magnificent all year long, the Japanese Bridge and Lily Pond are lovingly maintained and virtually look the same when Monet painted them! Everything from his gourmet equipped kitchen for back then are charming, you be glad you visited Giverny. Half Day Trips - All three Giverny tours. Visit Rouen and gros horloge [the famous clock] one of the most beautiful cathedrals in France, Joan of Arc's landmarks, on to Honfleur that will become a favorite of yours. 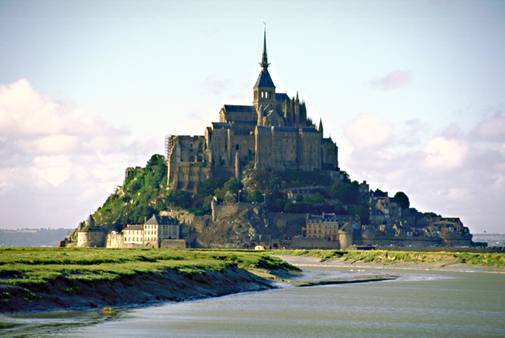 Day 2 visit Saint-Malo the city of pirates, Mont Saint Michel and overnight in Angers. Day 3 visit the chateaux Langeais, lunch at Amboise, visit chateau Chenonceau...see seasonal changes. Normandy War Memorials - this is a must for all veterans and families of those veterans to visit this most revered place. Rediscover the sites where the Allies fought to regain Freedom. It will be with strong feelings when you visit some of the areas where the Allies fought to recover freedom in 1944. There are several War Memorial Tours to select from, and a must visit when visiting Paris. The American Cemetery in Saint-Laurent, where 9,386 Americans rest guarded by the Spirit of the American Youth, a 22 foot-high bronze figure, and the Landing Beaches [60th Anniversary was celebrated in 2004] view. Palace of Fontainebleau - is a stunning Palace surrounded by its beautiful forest, and is one of the most beautiful and visited castles in France. 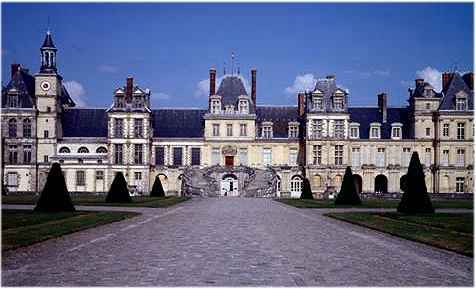 Fontainebleau was a favorite hunting residence of the French kings from François 1er to Napoleon III. The apartments were recently restored and are included in our guided visit of the Palace. This tour includes artists haven Barbizon that has been known as an artistic center since the 19th century when Jean-Francois Millet and Robert-Louis Stevenson lived there. Palace of Versailles - is the most visited monument besides the Eiffel Tower. This reconfirms our travel tip to buy your ticket before you leave home, because the lines are long to see the magnificent palace. Versailles Palace is a symbol of France's grandeur during the reign of the Sun King, Louis XIV. Some of the tours include different aspects of Versailles, including the Grand Trianons from April to September on Saturday and Sunday afternoons, the magic fountain display in the gardens. Some visits have audio guide in the State Apartments (Hall of Mirrors, Queen's Apartments). Entrance fees vary according to the type tour. View all the Versailles tour options on the MORE INFO link. Avignon Popes Palace - Chateauneuf was the Capital of Christianity during the middle ages, along with the Pope's palace, where the Popes reigned for nine centuries. The palace is situated next to the Rhone river, and it's famous Pont d'Avignon bridge. Lunch on your own on the Place de l'Horloge. Then, for the wine enthusiasts, discover the "clés de St Pierre" from Chateauneuf du Pape, famous cellars located between the Alpilles and the Luberon region. Two different tours are available. This is a fabulous city, with a rich French and German heritage. It feels as though you've gone back in time, but this city boasts home to several European headquarters, that include the European Parliament [shown at left] and this pass will give your admission to a free boat ride through Petit France and lock, a museum of your choice, visit the astro-nomical clock in the magnificent Cathedral, and much more then take lunch at one of the charming restaurants in Kleber Square.